24 Karat or .9999 gold is theoretically pure gold. Pure gold is element atomic number 79 in the periodic table of elements. The element “Gold” was discovered at least 5000 years ago. Gold is heavy and of a yellow reflective tone when in a solid mass (when in particles it has different tones). Gold is the most malleable material. Thus it one ounce of gold can be beaten into an around 300 square feet flat sheet. Thus it can easily be shaped into lots of forms without having to cast. Pure gold is unaffected by air, water, and most agent, thus it is almost totally resistant to corrosion and preserves well. Gold coins found at the bottom of the ocean, if protected from abrasion, look the same as when just minted even after hundreds, or thousands of years. So gold preserves well, without mass loss or changes. In addition, gold is scarce. Gold deposits are hard to find. Mining for gold is laborsome and expensive. Thus gold is not abundant. Although it is hard to come to exact figures, lots of calculations about how much gold exists in the world has been made. The amount of “official gold”, which is the gold held by government and major banking institutions, is estimated to, if all melted into a single, monolithic piece, have the volume of an around 60ft by 60ft by 60ft square. In addition, there is the unofficial gold. This is gold mostly in the form of jewelry and bullion held outside the banking systems. How much unofficial gold exists is even harder to count, but it seems to be at least three times that of the official gold. So, even if the above calculations would be vastly underestimated, and there is a lot more, still gold is very scarce. That is why gold is a precious metal. Another feature of gold is that it is easily recognizable. Only gold looks like gold and feels like gold. It just has that feel of concentrated mass and shining beauty. Because of the above, for already thousands of years gold has been the best way to store wealth. Thus, even today, with all the technological advances, gold has no substitute as storage of wealth. Central banks and individuals alike use it to store wealth. Scientifically speaking, gold, in practice, can never be pure. That is because in science, supposedly it is impossible to absolutely remove all impurities. So, according to scientists, there is always some non-gold particles in 24 Karat gold. The best way to look at this in practice is in the standards for trading bullion gold bars. For gold to be considered “tradeable”, it needs to be at least 995 parts per 1000 pure. The technical name for “Tradeable” is “Good Delivery Gold”. “Good Delivery”gold is gold minted by organizations accredited by the London Bullion Market Association (LBMA). The LBMA is very specific on their purity requirements. The LBMA is the ultimate authority in this subject. They have been dealing with precious metal bullion for a few hundred years so far. Basically, they know the subject very well. For the LBMA, there is no such a thing as a pure gold, even though it is can be 24K gold. For the LBMA, gold bullion, all of which is 24K, is graded as 995, 999 parts per 1,000 and 9999 parts per 10,000. Jewelry, even though it may have been manufactured with 24K gold, it is never 24K. The highest purity a gold jewelry may get is 97% pure. This is because the manufacturing process inevitably invites other materials. Because of this, only bullion truly qualifies as pure gold. 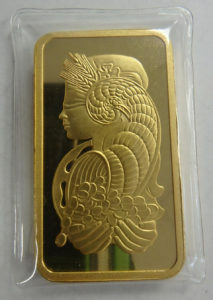 Portland Gold Buyers, LLC is always buying and selling gold bars.